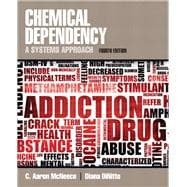 by McNeece, C. Aaron; Dinitto, Diana M.
Chemical Dependency: A Systems Approach, 4th Editionlooks at substance abuse from a systems perspective, making it particularly appropriate for social work students and other helping professions who are accustomed to a ;person-in-environment ; approach. The text presents all major theories of addiction, as well as the major physiological and psychological results of substance abuse, including fetal alcohol syndrome. Coverage of the latest developments in treatment (including pharmacological approaches)recent research on treatment outcomes, and a comprehensive discussion of etiological theories, including genetics. This edition includes an up-to-date discussion of the most recent trends in designer drugs to help explain the considerable frequency of changes in which drug use patterns occur. C. Aaron McNeece was a social work educator for 34 years, after working as a correctional social worker. He has conducted extensive research on both substance abuse and criminal justice issues. He served for 10 years as the director of the Institute for Health and Human Services Research at Florida State University, where he was also the Walter W. Hudson Professor of Social Work and later, Dean of the College of Social Work. He is currently Professor and Dean Emeritus. Diana DiNitto is Cullen Trust Centennial Professor of Alcohol Studies and Education and Distinguished Teaching Professor at the University of Texas at Austin where she teaches courses in social welfare policy, alcohol and drug problems, research, and pedagogy. She has a MSW degree and a Ph.D. in government from Florida State University. She has worked in a detoxification center, halfway house, and outpatient chemical dependency treatment program. She is also coauthor of Chemical Dependency: A Systems Approach, 4th ed. (Pearson, Summer 2011) and Social Work: Issues and Opportunities in a Challenging Profession, 3rd ed. (Lyceum Books, 2008). Her research in on substance abuse, violence against women, and social welfare policy. Dr. DiNitto has served on the boards of the Council and Social Work Education, the Association of Medical Education and Research on Substance Abuse, and the Texas Research Society on Alcoholism. She currently chairs the NASW Press Book Committee. She has been a visiting professor at the University of Hawaii at Manoa, University of Illinois at Urbana-Champaign, and the University of Sydney (Australia). Recently she gave the Robert J. O’Leary Memorial Lecture at Ohio State University entitled “Ending America’s Ambivalence in the War on Drugs” and presented invited testimony on drug policy to the United States Sentencing Commission. Can People with Alcohol and Drug Problems Be Believed?